Last Saturday we witnessed the first monument of the season unfold, la classica di Primavera. Just taste the word for a while, it carries memories from a past and promises to the future. It is a magnificent race and as the longest of the calendar as well as being a monument, it is a prestigious race to win. Much have been written about Mark Cavendish, Team Sky's primary hope, since he got dropped 90 kilometers from the finish line. Almost too bad since I feel we all should write about Simon Gerrans and his brilliant win. His win was nothing short of impressive, Gerrans win proved he was the smartest rider, smartness triumphs strength any day. Over the years I have learned that "one never questions decisions taken in the heat of battle". One can bring them up when the timing is adequate, to study and to learn, but since we didn't have the shoes on at the time, who are we to judge? However, the things we can question are tactics and strategy. Those are made prior to the race, making is easier for the roadcaptains and riders to act and react without always checking with the team car. Act upon intention, if you like. When the start signal goes, I feel prepared because I have done those 50 kms several hundred times before, going through every scenario possible in my mind. Sessions like these are important to athletes. Being mentally prepared can make the difference between success and failure. Knowledge of training, nutrition and technology have been researched thoroughly over the recent years and information about these matters and training methods are merely a click away. One could say that this has levelled the battlefield for the riders, and the main difference that remains, is mental coaching. Two favourites for the race, how plan and create tactics to match both? As Steven De Jongh said to procycling.no after the race, the team was supposed to ride primarily for Cav, if there was a minute or less gap at the Le Manie, the team would drop back and help Cav getting back to the bunch again. To me this is a strange tactic. Yes, the MSR was one of Cavendish' main goals for the season. Yes, Cav is lighter than last year and has shown good shape, but tactics are supposed to exploit possibilities, not minimizing them. EBH, Sky's second favourite, was left with Löfquist, who did a good job bringing EBH to the front over the Cipressa and near the front on the Poggio. But still just one man in support. To order the whole team back to help a rider showing weakness with seven more climbs 90 kilometers left, kind of limits your options, doesn't it? One would expect Sky to learn from last tdf where the whole team was set up to bring Wiggo to the podium. We all know what happened to Wiggo, who unfortunately broke his collar but Team Sky had a great tdf without him. This shows the potential in this team. EBH nabbed two stages, G in white for days (losing it when the whole team waited for Wiggo), Uran in white for days too. Cav was humble enough to let the team know he wasn't feeling too good on stage 3 of the Tirreno-Adriatico, giving EBH the chance to sprint for the win, so I believe Cav has a clear understanding of his capabilities and he has shown leadership before, taking care of his teammates. Question is, to what extent do the management provide sufficient resources to other riders? Team Sky is a British team, with roots all the way back to BC and track. Is it more difficult to divide resources to others when you have the reigning WC onboard? As far as we know, Cav felt good right upon the beginning of the race, but tactics need to cover all aspects and be known in advance. Norwegian cycling experts have questioned on procycling.no how much influence Brailsford and Ellingsworth had on Saturday's tactic. Of course, one could say Norwegians are biased in this matter as nationality goes, but questions like these do have a rightful place. I hope to see a different set of tactics later in the season. 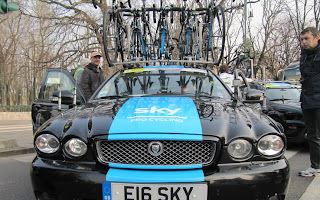 Team Sky has such a strong roster that they have many cards to play. If a rider is given a protective status, perhaps it is better to have more than just one man in support. How will Team Sky solve tour de France? There is nothing wrong in having options, to have the eggs in different baskets, you never know when you'll need them. I raised many of the points you bring up here with others. The response was Spartacus did not need support and so perhaps EBH was not strong enough. Also, if you have a plan and then drop it at first sign of a problem then that would also be wrong. One assumes that Cav believed that he would be strong enough to bridge the gap and be reinvigorated for final dash. It would not be the first time. On this occasion he was wrong. Victories are not created equal for Sky. On a Saturday during the football season they'll get 10 x the attention in GB if the great Cav wins again than a win for EBH. That's the prism the tactic has to be viewed through. Unfortunately, this probably means EBH will turn into some kind of combination of Tony Martin and Renshaw. Hopefully the Norwegians will ride for him at the Olympics and World Champs because that's pretty much his only chance of real glory this year. Ash; nice to see your comment, hope you are well. I didn't follow Fabian that closely during the race to see how much support he got, but he's a great rider who shoved his strength all the way. That said, a rider's strength does not say you can't give another (your best hope) as much support as he needs. But, I hate to speculate so I can't say it would have made any difference if EBH got two more riders in support. Haakon; Yes, the WC gives you different media attention on a win, no doubt. Combine that with a British owned and driven team. Sky has a very strong team with many talents. Would be a shame to focus solely on two men, but this is professional sport.